(17/P97) TRENTON – Historic Batsto Village in Burlington County will again host the annual Country Living Fair that offers visitors to the South Jersey historical area many opportunities to experience the joys of country life from the property’s founding in 1766 through present day. The Fair will take place from 10 a.m. to 4 p.m. Sunday, October 15 at Batsto Village inside Wharton State Forest on Route 542 in Washington Township, Burlington County. Visitors may enjoy crafts, exhibits, music, old-time engines and cars, food, antiques, pony rides, farm equipment, chain-saw art, quilting, and many more authentic South Jersey country attractions. The State Park Service has designated additional remote sites for parking and will offer van shuttle services throughout the day to reduce traffic congestion on Route 542. A modest $5 charge per vehicle will be collected by uniformed staff (cash only). A record-breaking 50,000 visitors attended the Fair in 2016. Batsto’s story is emblematic of the birth of the American nation for its technical innovation, rugged spirit and entrepreneurial ambition. A decade before America declared its independence from Great Britain, a local New Jersey man began the process of building the first arsenal of democracy on the banks of the Batsto River. Charles Read Jr. built an iron works using the region's native bog iron ore, forests and abundant water power, to create new housewares, tools, and farming implements. As tensions grew between Great Britain and her American colonies, it became clear that America would need a different set of tools to win and secure freedom. The same bog iron that was previously used to create cooking kettles and wagon hitches would now be turned to the use of creating cannonballs and other weapons in the fight for independence. After the American Revolution, Batsto Village continued to thrive and meet the needs of the new Republic for nearly another century. A glassworks was built to make use of the sandy soil of the region and produce windows until the demand for iron products declined with the advent of steel production. A century after the Revolution, Batsto Village had fallen on hard times but wise heads still saw the remarkable value in the old place. In 1876, a wealthy Philadelphia entrepreneur, Joseph Wharton, purchased the village and moved ahead with several new agricultural and forestry endeavors. Wharton introduced cranberry farming to the village and built a new sawmill to make use of the abundant tree resources all around the property. 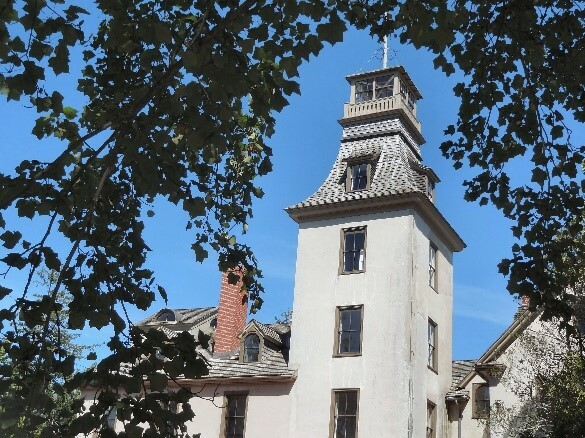 Wharton also set about repairing the structures around the village, including the famed Batsto Mansion and numerous other building on the property. Wharton continued these efforts until his death in 1909. The State of New Jersey purchased the original “Wharton Tract,” as it was then known, in 1954. Subsequent acquisitions using voter-supported Green Acres funding has seen Wharton State Forest expand to more than 121,000 acres. Today, Batsto Village is a portal to colonial and revolutionary days past, as well as a host site for festivals and gatherings celebrating that heritage. As a New Jersey Historic site, and as a listed property on both the New Jersey and National Registers of Historic Places, the DEP is pleased to have the help of the Batsto Citizens Committee, Inc., the primary Friends Group of Batsto, to help preserve and promote the village and its many attractions. Batsto is comprised of more than 40 sites and structures, including the Batsto Mansion, a sawmill, 19th-century ore boat, charcoal kiln, ice and milk houses, carriage house and stable, blacksmith and wheelwright shop, gristmill, and a general store. The Batsto Post Office, established in 1852, still processes mail with a postmark having no ZIP code. The Postmaster will offer a special cancellation stamp during the Fair. Batsto Village offers several venues, including the Annie M. Carter Interpretive Center, to help educate visitors about ecological treasures in the area, while a Visitors Center provides information and displays on how residents lived through the years.